The Canterbury Stakes is one of two Group 1 races held at Sydney’s Royal Randwick Racecourse on Randwick Guineas Day on a Saturday in early – mid March each year. The meeting is one of the first Group 1 race days during the Sydney Autumn Racing Carnival and is headlined by the three-year-olds facing off in the Group 1 Randwick Guineas (1600m). The Group 1 Canterbury Stakes is the major support act on the card and offers $500,000 in prize money. Originally run at Canterbury Racecourse it has taken place at Randwick after being transferred from Rosehill Gardens in 1997. Contested over a middle sprint distance of 1300m it is run under weight-for-age conditions and is open to horses aged three-years-old and upwards, holding Group 1 status since 2013 when star colt Pierro won. The Canterbury Stakes winner is exempt from ballot for the upcoming George Ryder Stakes and Doncaster Mile run at Rosehill and Randwick Racecourses respectively over the following four weeks. The latest running of the Canterbury Stakes takes place on Saturday March 9, 2019 . The official Canterbury Stakes results 2019 and finishing order will be announced below on Saturday March 9, 2019 . Happy Clapper dominated the 2018 Canterbury Stakes Results in a brilliant first-up success for the punters in a new race record time of 1 minute 14.25 seconds. Last start winners saluted in the race four times from 2011 – 2018 so those horses coming off a win often dominate the Canterbury Stakes betting markets. Favourites in the Canterbury Stakes odds have dominated the race throughout history including 13 winning since 1996, most recently Happy Clapper ($4.60 in 2018). The latest Canterbury Stakes favourite to salute prior to Happy Clapper (2018) was Cosmic Endeavour (2015). Because the race often attracts a small field the Canterbury Stakes barriers rarely affect the betting markets however the standout gate producing nine winners in the past 30 years is barrier nine. The season’s best Canterbury Stakes 2019 odds will be available below the week of the race so stay tuned for the best Randwick Guineas Day Group 1 racing markets. The Canterbury Stakes field attracts a wide variety of weight-for-age gallopers that come via different lead-up races and are often targeting different next-up options. 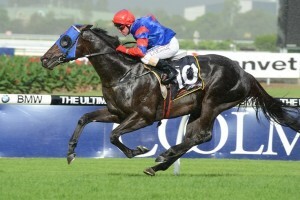 Pierro (2013) is one of the shortest-priced favourites to salute in the Canterbury Stakes. Photo: Steve Hart. Because of the ballot exemptions on offer to the winner many Canterbury Stakes winners go on to run in the George Ryder Stakes and Doncaster Mile over 1500m and 1600m respectively later in the autumn. Rarely does the race attract its capacity number of runners and the Canterbury Stakes field often features small numbers including 2018 (9), 2017 (8), 2016 (7), 2015 (8), 2014 (10) and 2011 (5) when More Joyous defeated home just four rivals. There were also only five runners in the 2008 Canterbury Guineas field when Mentality won as a 4/1 shot. Canterbury Stakes nominations close the Monday before the race with the final field and barrier draw out two days later. The Canterbury Stakes 2019 field and barrier draw will be published below once announced on the Wednesday leading up to Randwick Guineas Day so stay tuned to see what gun sprinters make the starting line-up. The Canterbury Stakes 2019 Nominations are open until the Monday of Randwick Guineas Day and will be available in full below. The best Canterbury Stakes betting tip is to back the favourite as they have a stellar record in the weight-for-age feature, which is one of Australia’s youngest Group 1 races. From 2011 – 2018 five of the Canterbury Stakes favourites saluted for the punters. Other Canterbury Stakes tips include looking at horses coming off a last-start win as they have a strong showing in the winners’ list and checking for any Gai Waterhouse-trained starters. Waterhouse has saddled-up over 20 runners in the race over the past three decades for an incredible seven wins including four of the five champions from 2011 – 2015. She also more recently ran second with Global Glamour in 2018. Bookmark this page for our insider Ladbrokes’ Canterbury Stakes tips 2019 with exotic betting selections to make on the Randwick Guineas Day support act this autumn. The Canterbury Stakes form guide shows runners in the race come off a mix of lead-up runs and there is no standout race line to follow into the event. The only races to produce multiple Canterbury Stakes winners over the past decade are the Group 2 Apollo Stakes and the Group 2 Hobartville Stakes both held the previous month at Randwick. Canterbury Stakes form also shows the barriers of all runners and while there is a fairly even spread one gate has produced more winners than any other, nine, but not since Empire (2002) and Defier (2003) went back-to-back. Mares also stand out in the Canterbury Stakes form guide with four winning from 2011 – 2015 with all but one prepared by Gai Waterhouse. A link to our comprehensive Canterbury Stakes 2019 Form Guide will be provided for punters the week of the race. The Canterbury Stakes results and final finishing order of all runners in the field is released when the race event takes place on Randwick Guineas Day in early March each autumn. The Canterbury Stakes winner, starting prices, successful margin and winning time are all listed in the results post-race. Notable recent Canterbury Stakes winners include Pierro (2013) and dual winner More Joyous (2011-12) both prepared by the race’s most successful trainer Gai Waterhouse.